Will iPhone Apps Replace Mobile Sites? Businesses have been asking me (for a long time) if they should create mobile sites (WAP) for their business. I think they should be asking themselves if they should be producing iPhone applications instead. I believe that applications can provide a much better experience than mobile sites. I thought maybe mobile sites could be designed to behave more like applications; then I remembered that WAP is an abysmal experience and could never create the type of interaction an application can. Because of this, the death of WAP is inevitable. Even with amazing browsers like Skyfire showing “non-WAP” sites, an app is a much better experience and provides a more seamless experience. Also, arguably more important, ad interaction on mobile sites is terrible while it’s much better on apps. The issue lies in peoples’ ability to find relevant applications. These things can’t be found using Google and only recently did Apple ask for “search engine like” descriptions of their applications. Sites like appolicious or uquery are planning on filling this void. You can’t download what you can’t find. 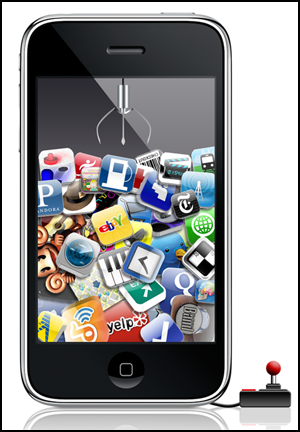 A business might want to offer a free app for the information that they would have on their mobile site. For those worried about space on their device, they could delete the application once they were done with it. This type of window shopping happens everyday. Businesses may also opt to be a part of an app that covers their area of focus; i.e. a Sushi Restraunt app for Denver would feature Osaka Sushi as one of the possibilities. Build a minimal mobile site to enable people to focus on any tasks surrounding your business model, such as mapping, coupons, etc. Create a mobile app with the same elements as the mobile site and much more. Think of your business in various customer situations and the potential to monetize via membership, ads, purchase of application and eCommerce. Build a usable, SEO riddled and 100% trackable terrestrial website. These three should be tied together via web services. There are enough moving parts online. Help yourself by eliminating as many moving independent parts as possible and insure that one team owns the digital arena.